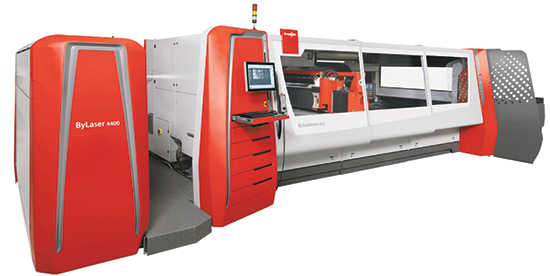 Bystronic, Elgin IL, will showcase its CO2- and fiber-based laser-cutting products, including ByAutonom and BySprint fiber systems equipped with ByTrans Extended. Also on display will be servo-hydraulic and servo-electric based press brakes, and the newly released Bysoft 7 programming system with full ERP interface capabilities. Featured at the booth will be the ByAutonom 3015 with ByLaser 6000. ByAutonom automated functions virtually eliminate operator intervention, reducing nonproductive time and lowering cost per part. Automated features include nozzle changing and centering, nozzle calibration, nozzle cleaning, lens cassette changing and auto-focus. Sensors detect nozzle contact with adjacent parts and automatically correct nozzle centering. An automatic maintenance and condition messenger informs operators of machine maintenance tasks and current machine condition status.